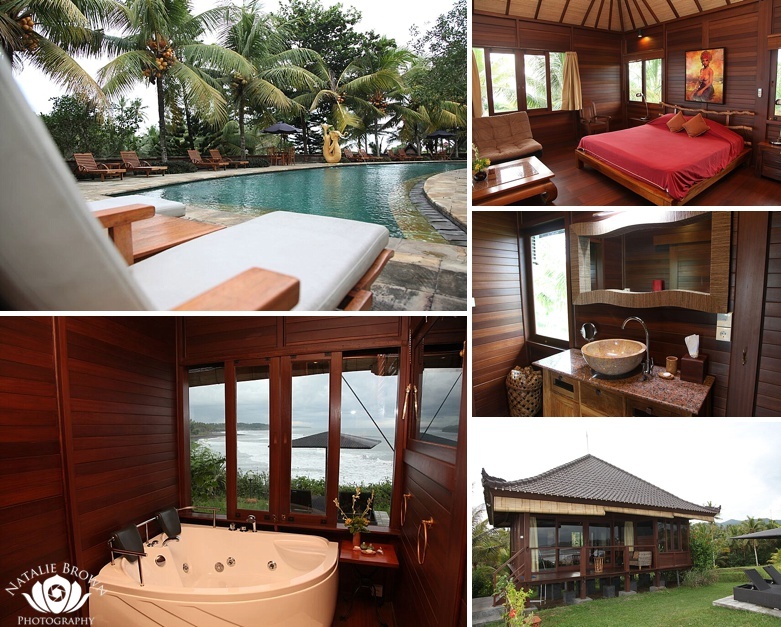 Gajah Mina Resort is the best place to stay while visiting the upper west coast of Bali. Their expansive grounds hug the coast, which gives them their own private, little black sand beach. It’s also sits over Balian Beach, a really fun spot to surf both lefts and rights. From Kuta, you’re looking at around 1 to 1 1/2 hours of driving. We’ve been to many high-end resorts on Bali, and this one is our favorite. These are just a few of the features that make Gajah Mina Resort superior to most. • The Honeymoon Suite. Enough said. While staying at the Gajah Mina, we enjoyed some incredible meals, epic surfing, and relaxing massages. Between surfing, we’d run up to the resort, have lunch, sit in the pool, then go back to the beach for another surf session. It was perfect. While we surfed, our ladies enjoyed massages on the cliffs with ocean breezes and crashing waves. This is a great resort for someone booking a group event like a wedding or yoga retreat. They have several locations for you to have large groups celebrating, meditating, or exploring. Now that you know where to stay, check out the waves you’ll be riding! Balian Surfing Beach picks up more swell than most spots, which gives it a crowd if everywhere else is flat. When we visited, the crowd was there with anywhere between 10 and 50 guys out at a time, but it never felt crowded. The good thing is that this spot has a bunch of lefts and rights, and it’s far away. If it’s working elsewhere, you’re likely to get bigger, less crowded waves at Balian Surfing Beach.